Welcome to Safety-Eyewash.co.uk: your one-stop shop for safety eye wash stations, safety showers and related products. As a market leader in safety eye wash units, our products are renowned for their exceptional build quality, reliability, and value for money. Whatever your requirements, we’re certain to have an eye bath unit that’s right for your workplace. 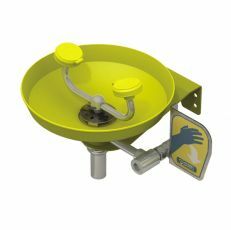 Our wall mounted eye wash stations are designed to be fixed to a wall for unbeatable stability, while our freestanding eye wash stations can be installed close to particularly hazardous areas. 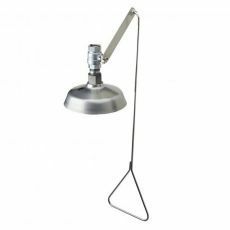 The fact that they’re floor mounted also makes them perfect for larger workspaces where a wall mounted unit may present too great a distance to travel in an emergency. Our portable eye wash station can be used anywhere, making it suitable for onsite work - even in isolated areas with no plumbing. The unit can store water safely for up to six months before needing to be refilled, thanks to the included water preservative. All of our safety eye wash fountains are designed for hands-free operation once activated by a low-resistance, high-visibility lever. In addition, we sell a safety eye wash with hand and foot operation, which can also be turned on via a foot paddle in the event that the user has also sustained damage to their hands. Our emergency decontamination showers also come in a range of mounting options. We supply wall mounted safety showers, ceiling mounted safety showers and freestanding safety showers to suit workplaces of all shapes and sizes. All of our emergency drench showers can be activated in a matter of seconds via a simple pull rod. Our combined safety shower and eyewash station brings together the best aspects of our emergency eyewash stations and decontamination showers into a single unit that’s both space saving and cost effective. Aside from being excellent value for money, our all-in-one emergency shower and eyewash units can be used in serious accidents where the individual has suffered injuries to both the eyes and body. 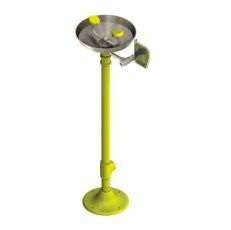 Freestanding pedestal eye and face wash fountains with hand operation and stainless steel bowl. 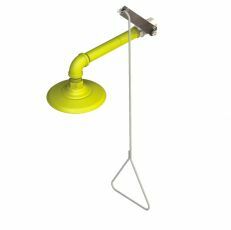 Horizontal wall mounted safety showers with pull handle operation, plastic head. Ceiling mounted emergency showers manufactured from stainless steel. 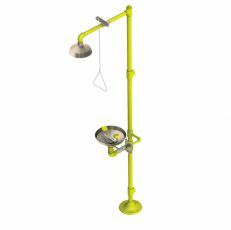 Freestanding emergency shower with combined eye wash unit, stainless steel bowl and shower head. 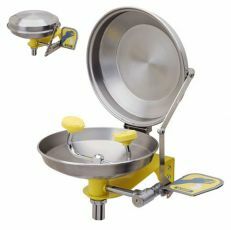 Wall mounted eyewash stations with yellow plastic bowl, hand operated. 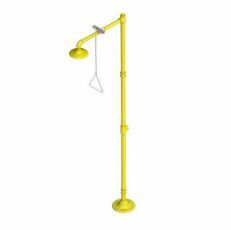 Steel floorstanding safety shower in hi viz yellow with plastic shower head. Wall mounted emergency eyewash station with stainless steel bowl and cover, hand operated. Emergency drench hose with stay open valve, yellow head, wall bracket and 2.4 metre hose. At Safety-Eyewash.co.uk, we take safety very seriously. Our safety eyewash fountains and bath units are manufactured from the most robust and reliable materials available, such as ABS plastic and stainless steel, so that you and your employees can rest assured that they’ll be there for you when it counts. All of our safety products are high visibility yellow so that they can be located with ease during an emergency. This is especially important when it comes to eye injuries when vision may be compromised. Once installed, it is essential that you test your emergency eye bath fountain every week to safeguard against operational failure. Each of our products comes with an integrated inspection tag for your convenience and peace of mind. Wherever possible, our products undergo extensive pre-assembly before being dispatched, in order to make the installation process as simple as possible. While we hope you’ll never have to use our emergency eye wash stations , we have a full list of operating manuals for training and installation purposes. This documentation will show you how to install, operate and maintain your safety products, and help you comply with the stringent ANSI regulations that govern emergency eye bath and fountain facilities. Visit our guide to the ANSI regulations to find out more. In the financial year 2015/16, an estimated 621,000 British workers suffered a non-fatal injury at work. Aside from the obvious trauma that workplace injuries cause to those affected, they can also have a serious impact on productivity: of the reported injuries, some 200,000 resulted in three days of absence from work and of those, 152,00 led to an absence of over seven days. Factor in the cost of workplace injury compensation, court costs and fines for negligence, and it’s clear to see that ensuring the safety of your workers doesn’t only fulfil your moral obligations, but also makes good business sense. Does my workplace need safety eye wash facilities? Our emergency eye wash fountains are designed for use in laboratories, factories, garages, warehouses, petrol stations, foundries, chemical plants, farms, building sites, schools, colleges, universities, or any other facilities that involve the handling of corrosive or hazardous substances. Upon contact with the body, the harm caused by these substances becomes graver with each passing second, and without immediate decontamination, the resulting injuries can lead to permanent scarring and disfigurement, blindness, and even death. That’s why access to emergency eye bath units and safety showers are an essential part of modern safety protocol. 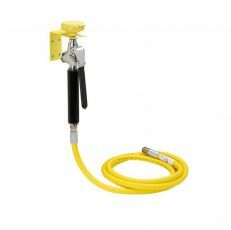 Safety eyewash stations can also be of use in workshops used for carpentry, masonry and metalworking where airborne debris is an issue. Our emergency eye bath stations can be used to clear the eye of foreign objects such as swarf, sawdust and stone fragments. If you’d like further information on our range of emergency eye baths and contamination showers, please call us on 01275 390643 or visit our contact page to send us a message.